The Ogallala Aquifer supports an astounding one-sixth of the world’s grain produce, and it has long been an essential component of American agriculture. The High Plains region—where the aquifer lies—relies on the aquifer for residential and industrial uses, but the aquifer’s water is used primarily for agricultural irrigation. The agricultural demands for Ogallala water in the region are immense, with the aquifer ultimately being responsible for thirty percent of all irrigation in the United States. The Ogallala Aquifer has long been unable to keep up with these agricultural demands, as the aquifer recharges far slower than water is withdrawn. The Ogallala Aquifer, also known as the High Plains Aquifer, underlies eight different states, stretching across America’s High Plains from South Dakota down to Northern Texas. It is an unconfined aquifer that is recharged almost exclusively by rainwater and snowmelt, but given the semiarid climate of the High Plains, recharge is minimal. In some areas, the water table is dropping as much as two feet a year, but recharge in the aquifer only averages around three inches annually. The aquifer provides nearly all of the water for residential, industrial, and agricultural uses in the High Plains region. Irrigated agriculture is particularly straining on the aquifer as the region is responsible for one-fifth of the wheat, corn, cotton, and cattle produced in the United States. The High Plains actually leads the entire Western Hemisphere in irrigation with fourteen million acres irrigated annually, primarily in Nebraska, Kansas, and Texas. Accordingly, farming accounts for an astounding ninety-four percent of groundwater use in the region. The resulting strain on the aquifer has been apparent for decades as recharge in the semiarid region has been unable to keep up with such a high demand. Because of the continuous decline in the aquifer, some areas that traditionally relied on the aquifer for irrigation are now unable to do so. “We are basically drying out the Great Plains,” according to Kurt Fausch, a professor at Colorado State University who studies the Ogallala. In Western Kansas, for example, water levels have declined by up to sixty percent in some areas as the gap between what is withdrawn for irrigation and what is recharged continues to expand. In northwest Texas, so much water has been pumped and so little recharged that irrigation has largely depleted the aquifer in the area. Without Ogallala water, significant portions of the High Plain’s agriculture and related businesses are entirely unsustainable, which could threaten the existence of entire towns whose economies are dependent on water drawn from the aquifer. There are global implications as well, as the region produces one-sixth of the world’s grain produce. A study from Kansas State University predicted that the aquifer would be seventy percent depleted by 2060 if irrigation practices do not change. However, the study further predicted that the aquifer could potentially last up to one hundred more years if all farmers in the region cut their use by twenty percent. Aside from the devastating effects on agriculture, a study recently published by a team of stream ecologists concluded that depletions to the Ogallala Aquifer are also leading to fish extinctions in the region. Streams and rivers that depend on the aquifer are drying out after decades of over-pumping. The study found pumping to be associated with collapses of large-stream fish and the simultaneous expansion of small-stream fish. This creates a catalyst for biotic homogenization, which in turn leads to less resilient aquatic communities and loss of ecosystem functions. The study predicts an additional loss of 286 kilometers of stream by 2060, as well as the continued replacement of large-stream fish by fish suited for smaller streams. The High Plains states are accustomed to periods of water shortages, and, accordingly, these states have all established the statutory or regulatory power to strictly control groundwater use. However, while the High Plains states all have the legislative authority to regulate use of the Ogallala aquifer to ensure sustainable use, some states have been more or less hesitant to exercise those powers. Those states that do not strictly regulate groundwater have instead chosen to leave conservation in part to the water users themselves. Two states in particular have highly diverged in their approach to regulating groundwater—Kansas and Nebraska.Each state has legislation in place allowing the government to force farmers to reduce water use, but while Nebraska has actively used that power, Kansas has been much more hesitant. Accordingly, the Kansas State Legislature amended the state’s water laws to allow groups of farmers and irrigators to voluntarily create Local Enhanced Management Areas (“LEMA(s)”) where they can implement their own groundwater conservation plans. These plans are then subject to approval by the state. Once approved, the plan becomes legally binding. One group of farmers has set up a ninety-nine square mile conservation zone where they agreed to a twenty percent reduction in irrigation for five years. After four years, they have steadily achieved their twenty percent reduction rate while, significantly, not seeing a reduction in profits. Some of their success has also been due in part to the implementation of drip irrigation and more sophisticated irrigation water management. While that is a step in the right direction, this group of farmers is still the only group that has submitted a plan in Kansas. This arrangement has proven its potential for success, but the question remains on whether it is scalable for the rest of the state. The fact that only one group has formed is likely due to how difficult it is to create one—here, talks lasted three years before boundaries were agreed upon, and members of the group said they had to change their whole mindset and culture to come to an agreement. Nebraska has taken a tougher stance than Kansas, and consequently has had more success in combating aquifer depletion. The Nebraska Ground Water Management and Protection Act allows the state government to limit irrigators’ water allocations as well as implement programs such as rotating water permits. Nebraska has also compromised with farmers, adopting a system like Kansas that empowers farmers and gives them control—so long as they come up with a plan to reduce use of the aquifer. The approach the state has taken has allowed Nebraska to sustain water levels—or at least slow depletion—in the Ogallala Aquifer better than most other High Plains states. Despite their success, however, the aquifer in Nebraska is still continuously depleting, and annual allocations to farmers have been steadily decreasing. Interstate compacts—created and enforced through federal law—have played a critical role in driving state efforts to curtail groundwater use. For example, part of the reason Nebraska has taken such a tough stance on groundwater pumping is because of their obligations to Kansas under the Republic River Compact. The Compact apportions Colorado, Nebraska, and Kansas each a supply of “virgin water” that is undepleted by human activity from the Republican River Basin, which is primarily drained by the Republican River and its tributaries. Much of the water from the Basin passes through Nebraska before entering Kansas via the Republican River, and Nebraska must limit water consumption to comply with the state’s obligations to Kansas under the Compact. As the Ogallala aquifer feeds into the Republican River, Nebraska has had to limit its use of the aquifer to comply with the Compact, which has resulted in a more sustainable use of the aquifer but also lowers crop yields for farmers. The federal government itself has addressed the issue of the depleting Ogallala by instituting the Ogallala Aquifer Initiative. The Initiative works by providing technical and financial assistance to farmers and ranchers to implement conservation practices that use less water, improve water quality, and keep croplands productive. The Initiative benefits agricultural producers by cutting costs for water, cutting costs for energy to power irrigation systems, and increasing crop yields. Extending the life of the aquifer also benefits the public at large, as the public directly benefits from irrigation with Ogallala water. In New Mexico, circumstances are more critical, prompting the federal government to take a more drastic approach. In eastern New Mexico specifically, the Ogallala aquifer has depleted to the point of crisis. To make matters worse, alternative sources of water in the area are primarily located along the border with Texas, where oil and gas development dominates water use. For its part, New Mexico has started reviewing hydrological information before renewing or approving new access to drill wells that involve using Ogallala water. The federal government has also stepped in, investing in a pipeline project called the Ute pipeline, which has recently required an additional investment of five million dollars. The project is designed to eventually bring billions of gallons of drinking water to eastern New Mexico from nearby Ute Lake. 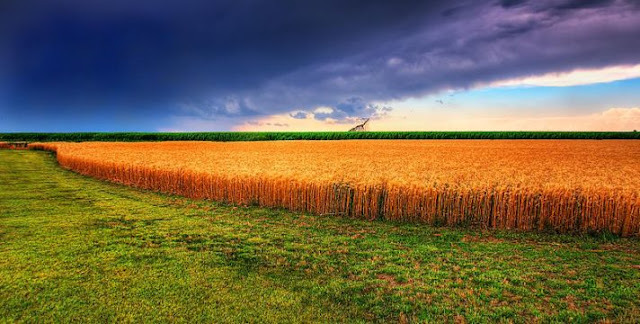 The Governor of Kansas, after seeing the success of the one and only LEMA group in the state, has recently declared that Kansas has been producing real results towards water conservation and that Kansas’s status as a breadbasket for the nation has been secured. However, it is important to remember to contextualize this success; it is only one group in an area less than one hundred square miles, meaning that the Ogallala is far from saved. And while there is value in allowing farmers to voluntarily take the reins in conserving the Ogallala, it is clear that they are not jumping at the opportunity to do so. The farmers themselves have commented that it is going to take a whole change of culture in the region to see the results that the Kansas legislature envisioned from the LEMA program—an uphill battle that certainly will not happen overnight. Nebraska is at least seeing some more substantial results from their hardline policies, which may be the direction the High Plains states need to take to avoid a major crisis. While the Ogallala may not be able to be completely saved at this point, it is certainly worth preserving for as long as possible, and states should not hold back in using their enforcement powers to do so. Image: A storm rolls over a field of summer wheat on the High Plains in Kansas. Wikipedia user James Watkins, Creative Commons. Brian Jacobs et al., A Vanishing Aquifer, Nat’l Geographic (Aug. 2016), http://www.nationalgeographic.com/magazine/2016/08/vanishing-aquifer-interactive-map. Edwin Gutentag et al., U.S. Geological Survey, Geohydrology of the High Plains Aquifer in Parts of Colorado, Kansas, Nebraska, New Mexico, Oklahoma, South Dakota, Texas, and Wyoming (1984). Effort to Manage Ogallala Aquifer Irrigation Falls Flat, Ag Web, https://www.agweb.com/article/effort-to-manage-ogallala-aquifer-irrigation-falls-flat. Governor issues statement on attainability of sustainable yield from Ogallala Aquifer, HAYS POST (July 20, 2017), https://www.hayspost.com/2017/07/20/governor-issues-statement-on-attainability-of-sustainable-yield-from-ogallala-aquifer. High Plains Aquifer Groundwater Levels Continue to Decline, U.S. Geological Surv. (June 2017), https://www.usgs.gov/news/usgs-high-plains-aquifer-groundwater-levels-continue-decline. High Plains Water-Level Monitoring Study, U.S. Geological Surv., https://ne.water.usgs.gov/ogw/hpwlms. Jane Little, The Ogallala Aquifer: Saving a Vital U.S. Water Source, Scientific Am. (March 1, 2009), https://www.scientificamerican.com/article/the-ogallala-aquifer. Joshua Perkin et al., Groundwater Declines Are Linked To Changes in Great Plains Stream Fish Assemblage (B.L. Turner ed. 2017). Kan. Admin. Regs. § 5-20-1 (2017). Karen Dillon, Ogallala water continues to pour onto farm fields despite decades of dire forecasts, Lawrence J.-World (Sept. 27, 2014), http://www2.ljworld.com/news/2014/sep/27/ogallala-water-continues-pore-farm-fields-despite. Mary Guiden, Groundwater pumping drying up Great Plains streams, driving fish extinctions, Colo. State U. (July 2017), https://source.colostate.edu/groundwater-pumping-drying-great-plains-streams-driving-fish-extinctions. Ogallala Aquifer, Tex. Water Development Board, http://www.twdb.texas.gov/groundwater/aquifer/majors/ogallala.asp. Ogallala Aquifer Intiative, U.S.D.A., https://www.nrcs.usda.gov/wps/portal/nrcs/detailfull/national/programs/initiatives/?cid=stelprdb1048809. Rex Buchanan et al., The High Plains Aquifer (2015). Susan Bryan, Effort to Bring Water to Eastern New Mexico Inches Along, U.S. News (July 14, 2017), https://www.usnews.com/news/best-states/new-mexico/articles/2017-07-14/effort-to-bring-water-to-eastern-new-mexico-inches-along. U.S.D.A., Groundwater Irrigation and Water Withdrawals: The Ogallala Aquifer Initiative (2013). Virginia McGuire, Water-Level and Recoverable Water in Storage Changes High Plains Aquifer (2017).